A utility jacket is still a huge trend for the Fall. It literally pairs perfectly with everything. It's like the denim jacket, you can use it to top off any of your outfits. 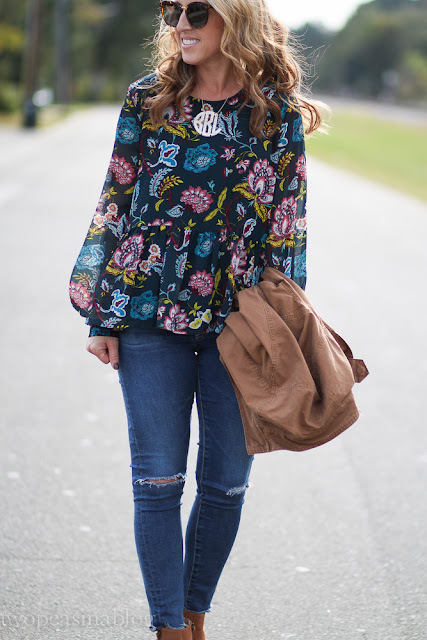 It works as a great layering piece and adds a little extra warmth for cool days. Add a pretty plaid blanket scarf for more warmth. 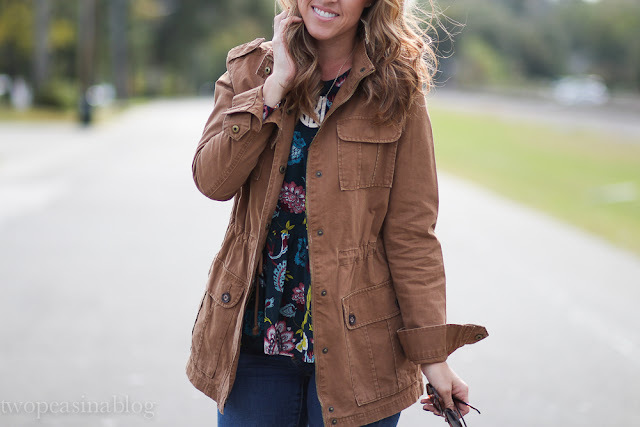 I found this brown jacket and fell in love with the color! 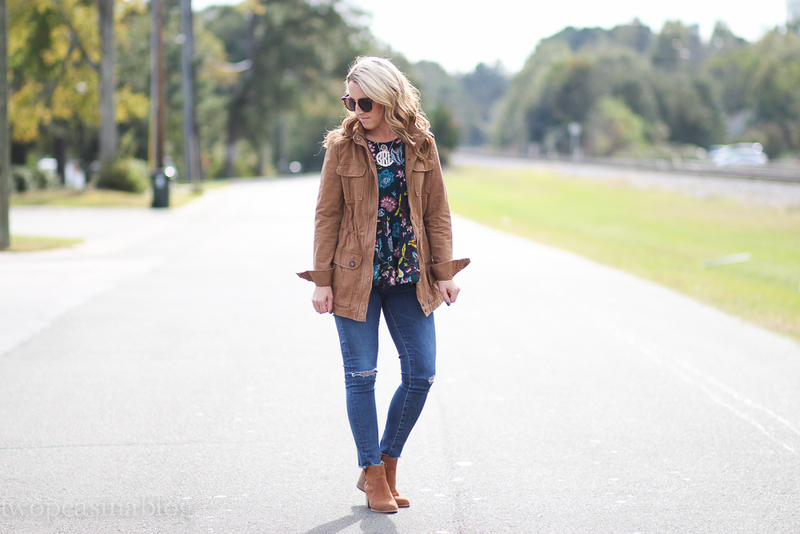 I already have an olive jacket and an olive vest, so this brown color is fun to add to my collection! And a perfect color for Fall. 1. Confession: I don't really like Halloween! I don't like getting scared in haunted houses. I've never really liked wearing a costume, well maybe when I was a kid I did. But now, I do not. I don't like all the gaudy decorations. Let's just get to the great holidays, like Thanksgiving and Christmas!!! 2. 5 weeks ago we had to say goodbye to our 16 yr. old chocolate lab, Bailey. It was probably the hardest thing I've ever had to do. And we miss her terribly. The house feels so different without a dog and I miss the company during the day. Yes, I talk to my dog!! The kids and I have decided we are ready to get a new dog, actually I want 2 puppies. My husband isn't quite on board yet, so we keep dropping hints! I'll share Bailey's story and the process of getting new puppies soon here on the blog. 3. Like everyone else, I got mums for my front porch and back screen porch. They are just so festive for Fall and I love the way they look. But they do not last long. Once they bloom, they die. Mine are about 1 week away from death. So I'm looking for what to replace them with for Winter. Pansies last all Winter into Spring here in NC, but I'm not sure that's what I want. Do you all have suggestions for plants/flowers for Winter? i'm so sorry to hear about your dog. our pets are such an important part of our families. as far as plants, while i like the look of mums, i never buy them b/c i feel they don't last. i really enjoy the giant kales they sell b/c they stay alive for me in philly until mid winter. Awww, thanks for your kind words. Great idea about the giant kales. I hadn't thought of planting those! Jess, thanks! I wish I knew a little bit more about flowers!! That's awesome that your mom can help you. So sorry to read about the loss of your beloved dog...Love the Peplum blouse and the monogram necklace. Is that the 18 in. chain necklace in the blonde marble finish? Aww, thanks! I actually have the 16 in chain. It's my most worn necklace!!! Kristi, thanks! We miss her, but are so happy we had her with us for so long. Have a wonderful weekend. I am so sorry about Baily, that is heartbreaking. On a lighter note, this is a beautiful look. The pattern and colors of your top are gorgeous. Elise, thanks. 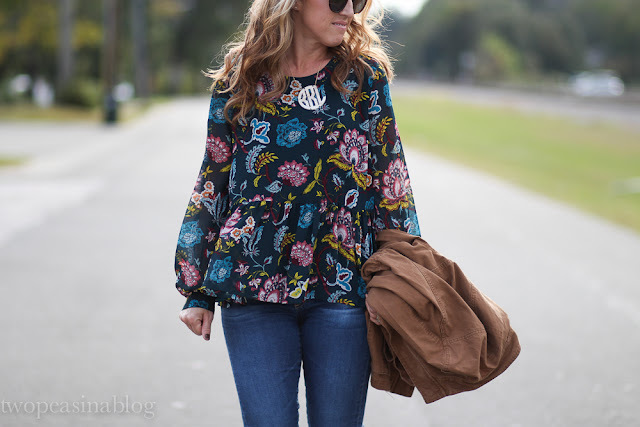 I love wearing a Fall floral, especially when it's a peplum!! I'm terribly sorry about Bailey. Our pets are so heartwarming to us and even though we know that they won't be around forever, it just doesn't make it any easier when they leave us. I know when we had to put our kitty down a couple years ago----I only made it 2 days before we rescued another one. And I feel the same way about Halloween. We don't even give out candy for the youngsters (as a retired dentist, it just feels wrong), so we always go out for dinner instead! Yes!!! My husband is an endodontist! Thanks for stopping by. Cute fall look! 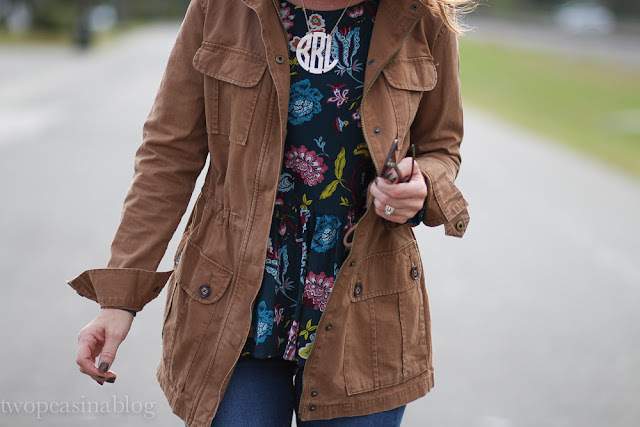 I love utility/military jackets!